Plans have been brought forward by Collective Architecture, Robertson Partnership Homes and Hillcrest Housing Association on behalf of Dundee City Council to regenerate Derby Street in the Hilltown area of the city. Occupying the site of a number of demolished high-rise blocks and low-rise sixties housing the scheme aims to recreate the street patterns of the Victorian era with the creation of two blocks of accommodation wrapping around central courtyards. Mirroring the massing of neighbouring tenements this will centre on the reintroduction of Russell Street, which will be built to Designing Streets principles, to help integrate the community. Lined with tenement scale properties to create an urban presence the street frontage will also be defined by larger scale interventions at key corners. Housing will be faced with a blended buff brick to offer a contrast with the prevailing grey granite tenements in the area and will range from one bedroom flats through to four bedroom houses. Dundee, keeps getting it so right!! Glasgow needs to follow their lead!! A scheme like this for the shambles that is Cowcaddens would be so beneficial, get rid of all the service buildings and restore the tenements. Spades in the hallowed Hilltoon turf and the continuance of Dundee's resurgence will be ensured! Good job on building an old school cardboard model ! Looks like someone actually cares about this. Petty the Alexander Street site isn't been handled in the same manner . Has anyone even bothered to check the current fire regulations related to cardboard buildings? 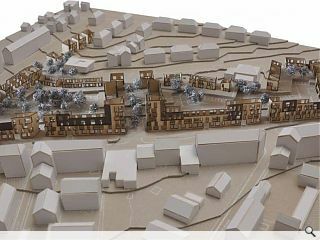 The lack of roofs may also be a problem for residents, albeit this is the first development in the area to propose windows which should be a welcome addition. Ask CAD Monkey, he'll know. Very nice! The fact they realise that Victorian planning is a big part of the solution is great.